Gujarat Government provides no.of opportunities to the candidates who were preparing to get Gov job in Gujarat. Every year Gujarat Government releases recruitment notifications for all available Government Jobs in Gujarat. Gujarat Government provides opportunities for all types of job seekers by releasing notifications Periodically. Candidates check State Govt jobs in Gujarat and Government Jobs Notifications in Gujarat on our website. Get Complete details like Jobs In Ahmedabad, No of Vacancies, Educational Qualification, Selection Process about Gujarat Jobs. 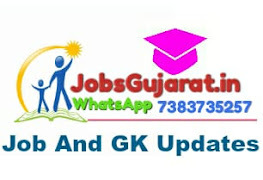 Maru Gujarat Jobs latest updates Provided here. Eligible Candidates, want to apply for Gujarat Government jobs should know the Selection Procedure, Application Process, Age limit, important dates. We gave all type of Government Jobs in Gujarat notifications. Check ojas.guj for updates of Upcoming & Latest Government Jobs in Gujarat.